Tales from the Borderlands is a big, funny adventure with great charactersworth playing even if you don't like Borderlands. What is it? 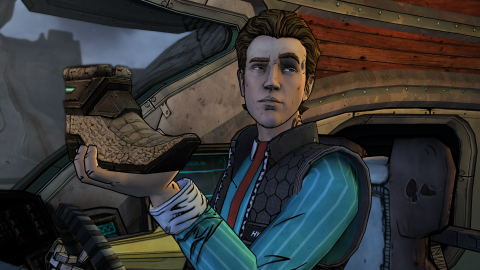 A five episode Telltale adventure that takes place in the Borderlands universe. Borderlands: it’s wacky! A portmanteau of ‘gun’ and ‘berzerker’? Wacky. Tiny Tina. Just plain wacky. Dubstep? Oh hell yeah, we’re ironically wacky! Barf. I’m not exactly a Borderlands fan, if you couldn’t tell. It may have some nice shooting and a few fun characters, but that ‘lol so random’ schtick, no matter how self-aware it is, will always make me grumpy. Except when it comes to Tales from the Borderlands. Tales from the Borderlands is great. It’s a story adventure spin-off which balances Borderlands’ urge to be impressed with itself for using swears with some great new characters and a tinge of sincerity. It’s not serious, but finds its levity through character-driven jokes more than screaming violence. There are are plenty of gruesome deaths, to be sure, but Telltale has created a stand-alone comedy adventure that succeeds because of great storytelling, not ‘midget psychos’ or freaking Claptrap. There’s no Claptrap at all. Thank goodness. I love the main characters—Fiona and Rhys—who are sardonic, conflicted, and cute but not nauseatingly so. They’re a funny, self-interested pair with questionable morals—almost, but not quite a cheeseball bickering anime duo. They’re both on shady ground when they meet, Fiona running a scam with her sister Sasha, and Rhys trying to screw over his corporate Hyperion boss with his best friend Vaughn. They all end up running around the dangerous, alien Pandora searching for one of Borderlands’ legendary vaults, getting into death races with bandits, befriending robots, exploring technological ruins, and struggling to balance their ambitions with their consciences—which is where we interact. As usual with Telltale, most of Tales from the Borderlands is about making quick decisions and reacting to on-screen prompts. Telltale games are often likened to ‘choose your own adventure’ games, but it’s not really the final outcome you’re touching with all the quicktime action scenes and timed dialogue choices. (At least, I don’t think there’s a secret Bad Ending where everyone dies.) Instead, your decisions alter details and let you define the context of the characters’ actions. You push around their values, adjusting how they perceive the story, and if they can say, at the end, that they acted out of pragmatism or compassion. Rhys, for instance, can choose to reject his desire for corporate power, or team up with a violent voice in his head and try to install himself as king. Fiona can try to save the mentor who betrays her, or let him die. While who lives and dies may not stop the plot from going where it’s going, it changes the story of how they get there. I like the format, and think it’s still an interesting way to present multiple angles on a plot, but I was a bit disappointed that Telltale didn’t deviate too much from its other games. It’s mostly familiar: shift the tone of a conversation, choose to lie or tell the truth, make a binary choice here and there, and awkwardly poke around small areas until you’ve looked at everything. New opportunities for comedy, like an inventory system, are rarely used, and only automatically. I was hoping that manually trying to use items on things in the environment would surprise me, for instance, but I never found that it did anything. The action, as usual, is mostly about pressing a key when prompted, or clicking on the thing that needs shooting. It’s not challenging and really, it lacks everything I typically like about games: rules to learn and exploit, decision-making and strategy. But often times, the humor and direction are just fun to be a part of, like the time pressing ‘W’ caused Rhys to unintentionally gut a monster and cover himself with entrails, or a battle which sends up anime and fighting games wonderfully. One thing I've always disliked, and is here plenty, is mashing 'Q' to fill up a meter. Why does Telltale hate my 'Q' key? Speaking of entrails, though, TFTB is pretty gross, as you’d expect from a Borderlands game. There are two scenes involving an eyeball, and a severed face at one point. One of those eyeball scenes, though, gave me the biggest laugh of the series. What starts as a generic gross out gag become a hilarious conversation between two great characters, which is what I appreciate so much about TFTB. Some of the humor is dumb, for sure—like the goof that the corporate drones at Hyperion settle their differences with gunfinger fights—but when it isn’t recycling jokes from Spaced, TFTB’s best laughs come from the well-meaning bumbling of fun characters. I especially liked Loader Bot, a selfless but judgmental assault robot who never fails to be the team’s deus ex machina, and grows attached to another robot, the naive Gordys who can be convinced that dead bodies are just sleeping. Vaughn, Rhys’ best friend, has a few good scenes, but he’s usually a bit dull—his thing is that he’s afraid of missing out, and that’s all I really got from him. The same goes for Sasha, Fiona’s sister, who’s a little more complex but still feels light on detail. But everyone gets a good gag here and there, and I grew attached to all of them. I even cared about the romance subplot—rare for a grump like me—which includes some awkward dialogue so well voice-acted that I laughed out of embarrassment. There are five episodes, each around 90 minutes long. I didn’t love the second episode—there’s some awkward ‘exploration’ and a few jokes that fell flat for me—but as whole I recommend it highly. The finale is longer than the rest, and if you’ve been enjoying the series up to now, I don’t think it’ll let you down. It does get bit sentimental and cheesy—always winking at us to make sure we know it’s aware of its own cheesiness, of course—but dammit, it’s cute. Rhys is cute, Fiona is cute, Vaughn and Sasha are cute, Loader Bot and Gordys are cute as hell. Even when I felt like I ought to roll my eyes at a weak joke, I liked the cast too much to want to. Tales from the Borderlands is a great game, even if you don’t care about Borderlands. The walking around bits are awkward, but I like being given a chance to chat one-on-one with each character in the scene. The story is told by Rhys and Fiona as they narrate to a mysterious captor. The action is a lot of clicking and hitting directional keys, but it's often creative and funny. And gory. Patrick Warburton is great as the voice of Rhys' corporate rival, even though all I heard was Brock Samson. This is from one of the musical opening credits sequences, which are great.